Sometimes it's the little things that catch my eye. 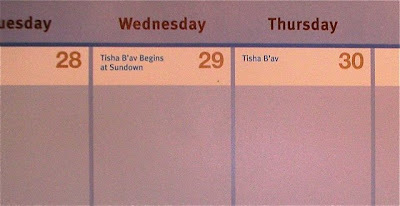 I was looking at a 2009 calendar from Family Facts, and suddenly realized that it was showing me Tisha B'av - and even indicating that it starts at sundown. (See below.) 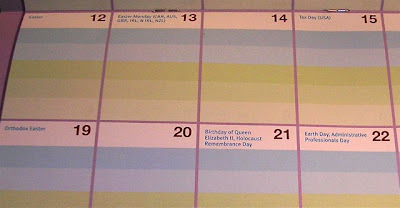 While I'm used to seeing the more well-known Jewish holidays on some calendars, Tisha B'Av is not one of those. And then I flipped a few more pages, and saw that the calendar included quite a range of holidays. Now, I haven't used a paper calendar in a while, so maybe this is fairly common now - but it's sure a change (and a nice one) from the calendars I used to own. Wow, my Franklin Covey planner didn't even have Purim--I had to look it up on the calendar to remind my mom to mail me some hamentaschen. It sure doesn't have Tisha B'Av or Tu Bishvat. Does that calendar also have Moslem, Hindu, Sikh, etc. religious observances? 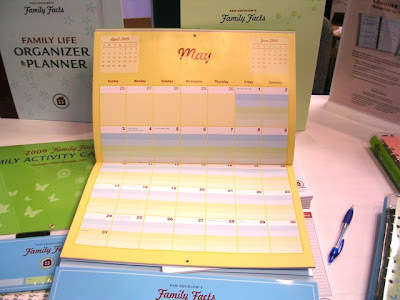 It would be nice to have a calendar to recommend to clients who want a culturally-sensitive paper planner. I don't know, Julie; I should have thought to look for that, and I didn't. The pictures I snapped didn't happen to catch any. I'll see if I can find an answer. Julie, I just got an answer. "Unfortunately, it doesn't have Hindu or Sikh holidays, but it does have Islamic ones." Again, thanks for going the extra mile! Glad to do it, Julie. If anyone else would like to get the listing of all the holidays on the Family Facts calendar (in a Word document) just let me know - and make sure I have your e-mail address. You can reach me by leaving a comment here, or by sending e-mail.